It a small erect annual herb. It is indigenous to the rainforests of the Amazon and other tropical areas throughout the world. 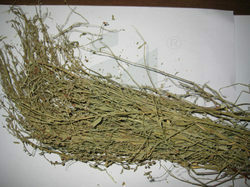 It gives relief from jaundice , constipation , skin itching , etc. We are looking for Export Inquiries from All Over the World. Our company is counted amongst the foremost Chanca Piedra Exporters and Suppliers in India. Phyllanthus Niruri (Bhuiamla) Extract that we supply in the market is known for its high medicinal properties and is available with bitter content ranging from 2-6%. Customers are also eased with the availability of the Chanca Piedra Herb at the most prolific deals. Description Bhui Amla - Bhumyamalaki used for problems of the stomach, genitourinary system, liver, kidney and spleen. Other Names: Bhumyamalaki, Phyllanthus niruri, stonebreaker, Keezha Nelli, Nila Nelli, Keezhar Nelli, Nela Usiri, dukong anak, dukong-dukong anak, amin buah, rami buah, turi hutan, bhuiaonla, and Meniran. Phyllanthus Niruri Sensu Hook.f.non Linn.